Hi friends, we've got some fun things to talk about today, so let's get to it. 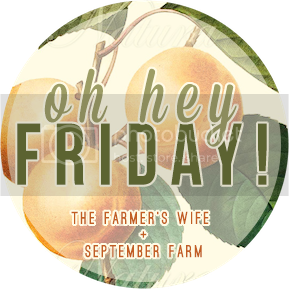 It's been exactly one year since Karli and I started this fun Friday link up! We have met so many great friends, and found lots of great new blogs to read. Thank you all for your participation and hanging out with us this past year. So how about a fun little one year anni giveaway!? We are busting out some ad spaces for you guys to win. There will be four winners total, and each ad space is valued at $25. This is a great way to grow your blog… for free. Win! Get entered… chances are, if you are reading this, you follow me, so your chances are looking good. Cruising right along on this pregnancy train. 17 weeks and feeling great. This is probably the best time in the pregnancy as far as I am concerned. No more nausea, not too awful big, and some energy. - - I have started feeling baby move this week. Very exciting. - - As of last Thursday at my doctors appointment, I had only gained 3 lbs. This is notable because with my first two I had probably gained 15. My Fitbit is keeping me on track, and I am trying to reign in the amount of pizza I eat. - - Baby is about 5 inches long, can move it's joints, and it's sweat glands have started developing… let's just hope it doesn't have my chronic nervous pit sweat. 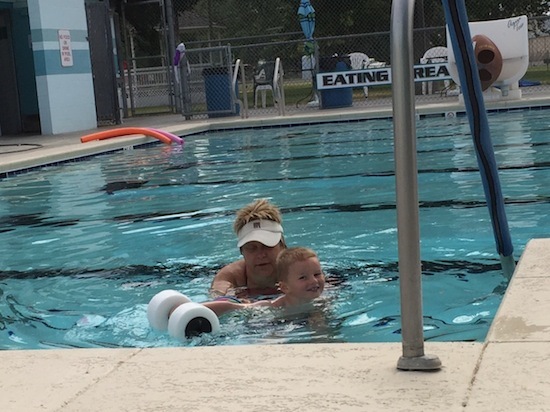 This week Brody has been taking swim lessons. Beckam and I go and toodle around in the pool at the same time… kind of like our own "mommy and me" class. It had been going great! Right at the end of the lesson Brody's teacher and I were trying to get him to put his face under the water. He HATES getting his face wet, but he kind of has to get over it because he has to learn to swim, like yesterday… there is a lot of water around a farm. We gave him goggles and explained how to blow his bubbles so the water wouldn't get up his nose. His teacher even bribed him with fruit snacks. But alas, he still wouldn't/couldn't do it. At this point the teacher's next student had showed up, so I just told Brody that we would try again tomorrow. He promptly, out of no where, started faa-reaking out and crying "fruit snacks!" because he wouldn't get the fruit snacks unless he completed the task. The teacher and I both walked him through how to do it again, for the 25th time, but he was already long gone. No calming down, not able to do anything but cry. Loudly. Mind you, my other child, was also right next to me in the pool wanting me to carry him and crying because I couldn't since I was still encouraging Brody to blow some bubbles. Two kids. Both crying. Loudly. And nothing I said was making them stop. More than anything, it was incredibly embarrassing. Needless to say we practiced lots in the bathtub last night. And we also had a nice long chat about behavior. Our raspberries are in full production, and we are loving it! Perhaps it is because my annual vegetable garden blows… no really, it's less than desirable and never got finished being planted. SO… having something to drive your tractor to so you can pick and eat it is pretty fun. Today is the last day to get in on my 30% off ALL ad space sale. Every ad space has the option to participate in the group giveaway. And let me just tell you… this is a group giveaway to get in on. Since it's my birthday month, I've got some awesome extra's being given away. I'm already hoping I win. If you are interested, head to my advertise page HERE and use code FARMBABY to cash in. And now… it's time for you to join in on this fabulous link up. Cheers to another year of Oh hey, Friday! You are extremely adorable pregnant! I love your outfit. Poor Brody. I hope he gets over it & is able to put is face in the water. Yay for 17 weeks and for 1 year of hey Friday! Happy weekend! three kids… how do you do it! ?